Bill, have you ever posted one of these random shots of the Fair and have someone from this site contact you and identify himself or herself or someone they know in the photograph? With all of the various images, along with the fact that so many posters here attended the Fair, there must be some sort of reasonable odds that this could happen. One person identified his sister's boyfriend. For a moment I thought the blonde haired woman might've been my mother but none of the people with her match up to any of our family that might've attended with her. Jim, so far I have had 3 people find themselves or family members. Plus another one who found his family on one of my Disneyland CDs. Oh - there was also the woman who was on the Kodak pavilion in one of the giant prints. I keep looking for myself or people I know but no luck yet! Yeah, I keep looking to find my parents or my sister (or even me) in one of the shots. 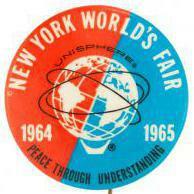 We visited in early September of 1965. I'll keep looking. Don't forget the teenage girls eating Belgian waffles. I just noticed the little round-topped fencing along the grass at the corner to the left. I wonder, why there? I've never noticed it elsewhere, before. It looks like an afterthought to prevent people from trampling the grass. Edit; I tried to identify that path between the little fences, and it looks like it's the "back door" to the tent of tomorrow. If so, I wonder if it was usually open or closed? Weird path to dress up with a cute fence! I never noticed that fence either! How 'bout those signs above the Boy Scout? I think those signs are for the Greyhound tour routes. I never noticed this gingerbread gate design either, which seems to go with the little fence. Seldom photographed because the gate was open most of the time. Notice the picnic tables directly above, on the mezzanine. Yes, those are Greyhound signs. I keep looking for myself of people I know but no luck yet! It still amazes me that it hasn't happened more often. There must have been a billion photos taken. I think the first- way back- maybe 2003 or so- was Hoodlock who recognized a guy sitting in the bar at the Oregon Pavilion, was his sister's boyfriend. The same guy was in several pictures in the same set. That little fence, the one discussed in several posts above, looks like a basic lawn protecting fence. It looks like similar temporary fences available at any garden store or big box hardware store and is used to protect the grass or small plantings. 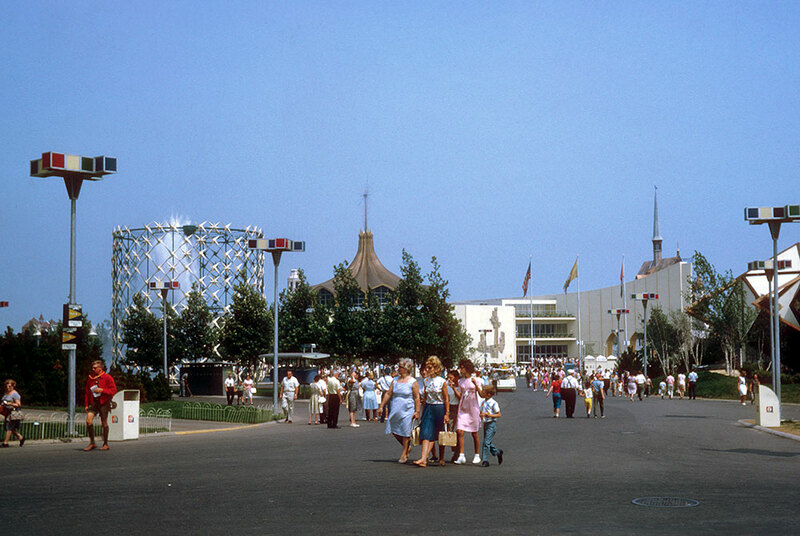 That grass is very green although the Fair existed, especially in 1965, during a powerful drought. Maybe that's all that little fence was intended to do--keep people off of the grass. lesson learned from the 64 season- corner cutters kill grass. Some pavilions went with the opposite solution- pour more concrete where people wanted to walk.